The popular Real Audio plug-in for web browsers is perfect for electronic music for a simple reason: the sounds of electronic pop remain unfamiliar enough to keep the relatively poor quality of the transmission from distracting. Furthermore, the RA format is easy to produce, and the ease of that endeavor has contributed heavily to a virtual groundswell of bedroom composers on the web. If your PC is wired for tunes, get thee to the Hollowman’s web site (jonx.clara.net/hollowman.html) for a taste of how casual it is for the Everysampler to make his music public; as the homepage’s tag line announces: “this site homegrown using notepad. looks ok under netscape.” The Hollowman “outed” himself recently by posting his URL on an Internet mailing list dedicated to “Intelligent Dance Music,” and the three tracks of chill-out background music are worth the trip. “Abuseless” spins a lackadaisical swath from what we once called goth and “Functional (Dub)” applies a fanciful farfisa beat, of sorts, to the proceedings. The best track, though, is “2 Part Set,” which Hollowman’s limited notes refer to as “not friendly,” but which will definitely please adventurous cubicle surfers and home enthusiasts with its industrial timbres and elegiac flow. The tracks are also available in downloadable MP3 format. 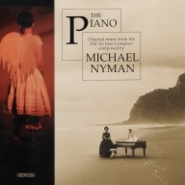 Michael Nyman came of age as a classical composer in the radical London of the late ’60s. His work embraces multiple vernaculars (jazz, avant-garde, conceptual art) and helped cement the foundation of what came to be known as minimalism. Decades into his career, Nyman’s score to Jane Campion’s film The Piano made him a star. The movie’s themes of colonialism and silence (its protagonist, portrayed by Holly Hunter, cannot speak) were perfectly aligned with his longtime interests in world and ambient music. Horn players assist members of the Munich Philharmonic Orchestra in fleshing out Nyman’s stately, hymn-like motifs. On the more heavily orchestrated cues, sentimentality wins out over minimalist restraint; the best tracks feature Nyman on solo piano, playing the rudimentary, faux period repertoire of Hunter’s character. Date of publication is rough approximation; review written for Amazon.com long after the release of the album. Slow Gold II (software): Ostensibly, a new piece of software called Slow Gold II ($89.95), a product of WorldWideWoodshed, renders fake books redundant — provided you have the patience to do its bidding. The software’s premise is simple: it will play back recorded music at a considerably slower rate, facilitating study by maintaining the music’s original pitch throughout, whether you slow the tune to half or even a fifth of its original speed. Trying to ape one of Janis Joplin’s inestimable yodels or one of Thelonious Monk’s leapfrogging melodies? Just drop your CD in your PC clone’s drive (Macs aren’t eligible), apply Slow Gold liberally and mimic to your heart’s content. Reviewers from PC Magazine to Guitar Player have praised Slow Gold’s simple interface and quality audio. The instructions report “a 10-second loop, slowed down 50% with the highest-quality algorithm, took 15 seconds to slow down on a 300 MHz Pentium II”; repeated experimentation confirms those numbers. The only thing that’s missing, really, is the software’s ability to provide note values at various points along the way — but since the software is aimed at the guitar enthusiast or someone with rudimentary music theory, that feature would be pretty superfluous. An additional audience, however, lays in wait. The sound quality of Slow Gold’s samples is excellent, and the paint-by-numbers controls suggest that ambient music fans may have a new tool to play with. Has repeated listening to your favorite Steve Roach or Brian Eno CD lent the music an all too familiar feel? Well, then dial it down with Slow Gold II. Make Eno’s ‘Thursday Afternoon’ album last all day. When Disquiet.com first launched its "Crate" section, a distinction was made between "ethereal" and "physical" releases. Those "ethereal" ones later came to comprise the site's Downstream section. This was the site's first "ethereal" entry, all of which were collected under the following explanation: Web music is ethereal by nature, just data out there on the vast and, excepting password-protected FTP sites, public network we call the Internet. The big question isn't some much "what" as "where": where are the freshest MP3s, the great RealAudio streams, the self-generating software?